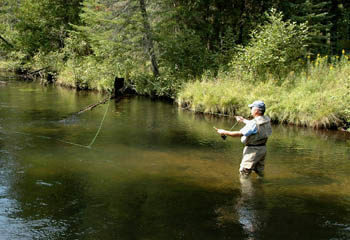 As far as anglers are concerned, most of the Sturgeon River in the Green Timbers area is a hike-in adventure. 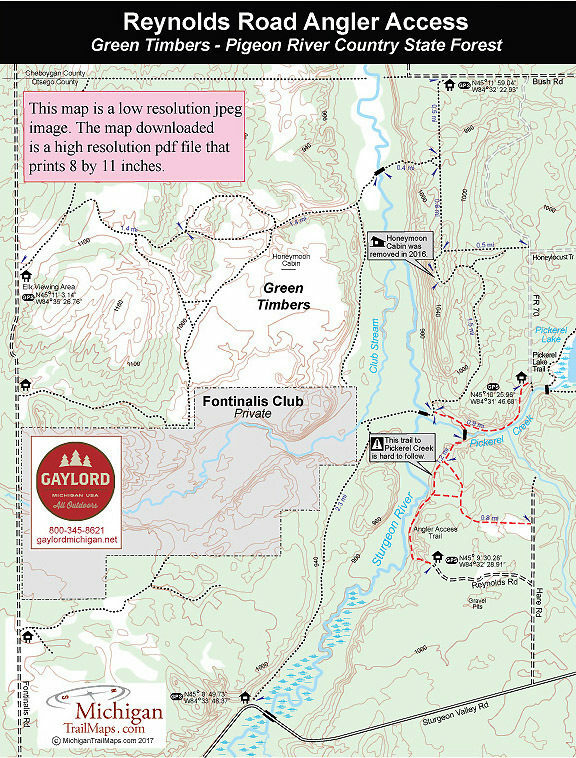 Many who want to fish and then overnight hike to the Green Timbers Cabin, a 2.3-mile trek.The Reynolds Road Anglers Access, however, is the easiest way to reach a portion of this Blue Ribbon trout stream within this otherwise non-motorized tract. Except for Reynolds Road, no two-track in Green Timbers is open to vehicles. As far as anglers are concerned, most of the Sturgeon River in the Green Timbers area is a hike-in adventure. Many who want to fish and then overnight hike to the area where the Green Timbers Cabin once stood, a 2.3-mile trek. The Reynolds Road Anglers Access, however, is the easiest way to reach a portion of this Blue Ribbon trout stream within this otherwise non-motorized tract. Except for Reynolds Road, no two-track in Green Timbers is open to vehicles. To reach Reynolds Road, head east on paved Sturgeon Valley Road from the Sturgeon Bridge and within 1.6 miles turn north (left) on Hare Road. Hare Road is not signposted but it’s the first dirt road beyond the stream. Follow Hare Road for half a mile and then turn west (left) on Reynolds Road, which is posted with a “Fisherman’s Access Road” sign. Reynolds Road ends in 0.7 miles at a parking area capable of holding six to eight vehicles. From the parking area, a distinct foot trail heads steeply down a bluff and in less than a quarter mile breaks out at a grassy opening overlooking a bend in the Sturgeon. At the bend the river is 40 to 50 feet wide, two to four feet deep, and holds a sand trap that needs to be avoided. Both upstream and downstream the Sturgeon narrows to 35 feet and features lots of sweepers, sunken logs, and overhanging cedars that need to be avoided when casting. But the structure provides excellent cover for trout. A faint foot trail can be followed downstream and according to older maps it extends to Pickerel Creek. But this trail is difficult to follow at times. Other than trailhead parking areas and the two free-use shelters, Green Timbers and Honeymoon Cabins, there are no facilities in Green Timbers. That includes campgrounds or even vault toilets or sources of safe drinking water. The Pigeon River Country State Forest Headquarters (989-983-4101) is open 8 a.m. to 5 p.m. Monday through Friday. There are no vehicle fees to hike, bike or ski the state forest but there is a nightly fee to stay in the rustic campgrounds. From I-75, depart at exit 290 and head south for Vanderbilt. In town turn east(left)on Sturgeon Valley Road and follow it for 7 miles. The main entry to Green Timbers is the stonegate trailhead on Sturgeon Valley Road, reached just before crossing the Sturgeon River. To reach the Pigeon River Country State Forest headquarters (517-983-4101) continue east on Sturgeon Valley Road for 5 miles and then turn north (left) on Twin Lake Road. The easiest way to reach the Bush Road trailhead is to turn north on Pickerel Lake Road that is well marked with a state forest campground sign along Sturgeon Valley Road. Head north for 4 miles, past the entrance of Pickerel Lake State forest Campground, to a “T” intersection. To the east (right) is Grass Lake Road, to the west (left) is Bush Road. Head west and in less than 2 miles or right before Bush Road makes a 90-degree turn to the north, look for a parking area on the south side of the road. For additional information stop or call the Pigeon River Country State Forest Headquarters (989-983-4101), an impressive log lodge on Twin Lakes Road. For travel information to the area contact the Gaylord Convention and Visitors Bureau (800-345-8621).